Heat oven to 450ºF. Spray rectangular pan, 13x9x2 inches, with cooking spray. Place bell peppers and onion in single layer in pan. Spray vegetables with cooking spray. Bake uncovered 15 to 20 minutes or until vegetables are lightly browned and tender. Meanwhile, cook and drain pasta as directed on package. Rinse with cold water; drain. Toss bell peppers, onion, pasta and remaining ingredients in large bowl. Serve immediately, or refrigerate 1 to 2 hours. Did You Know? 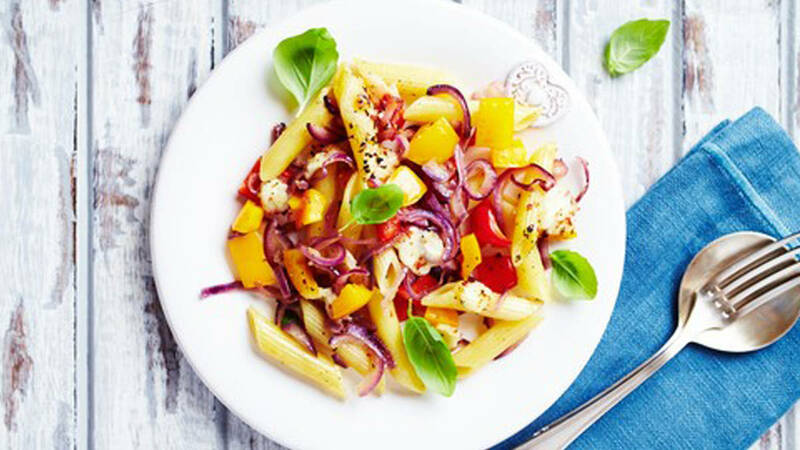 : Roasting bell peppers and onions brings out their naturally sweet flavour, but if you're pressed for time, you can skip this step for a crunchier salad.